I had a busy working afternoon in Adare, Co Limerick, today [27 April 2017]. But on my way back to Askeaton, as I was going through Adare, it was a delight to see that work on refurbishing and rethatching one of Adare’s beautiful thatched cottages is nearing completion almost two years after it was badly damaged by fire. 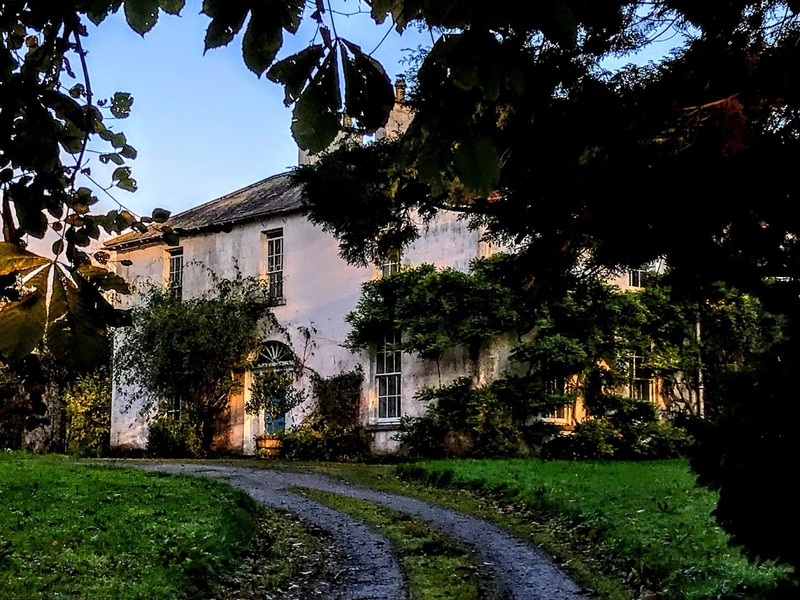 The Benson cottage was approved last year for a grant of €16,000 for repairs, announced by the Minister for Arts, Heritage and the Gaeltacht, Heather Humphreys. It was one of 57 heritage projects to receive funding under the Structures at Risk Fund for 2016. In June 2015, a fire completely destroyed two of the thatched cottages, which are popular with tourists. The cottage are attractive assets to Adare, and there are high hopes that that both cottages can be restored to their former glory. The fire broke out early in the afternoon as a wedding was about to start across the street in the 13th-century Holy Trinity Abbey Church. One cottage was gutted in the fire, a second was burned to the ground, and serious water damage was caused to a third cottage. The fire was a ‘horrible tragedy’ for Jane and Henriette Benson, who lived in the cottage that is now being refurbished and rethatched. The second cottage was owned by an Irish-American businessman who lives in New York; the woman who was renting the cottage was preparing to move out and had packed everything, but lost all she owned in the fire. The third cottage, owned by Lucy Erridge, who runs a fashion and crafts shop, sustained serious water damage but was saved from the fire and is back in business. After the fire, Henriette Benson said that all of the family’s possessions were destroyed, along with the house that had been their family home for many years. The two houses that need restoration, refurbishment and rethatching are among 11 remaining thatched cottages built in Adare in 1826 by Lord Dunraven as staff houses, and they have enjoyed landmark status in the town ever since. This week, it was a joy to see workers busy completing the thatching on the Benson cottage after full refurbishing. The site is fenced off but is attracting considerable attention. Sadly, the second cottage destroyed in that fire remains untouched, and Limerick City and County Council has posted a notice declaring its intention to place the site into the Derelict Sites Register. The cottage is at the end of a row of thatched cottages, beside the Benson cottage. The council now considers it a ‘derelict site’ and plans to place it on the register unless the ‘unknown owner’ makes representations this month. The semi-detached three-bedroom cottage is still in the process of being sold, after a sale was agreed in January at ‘substantially above’ its asking price of €130,000. The new owner, reportedly, is from the Limerick area. Thousands of euro would be required to restore it to its former habitable state. Meanwhile, work continues on the multi-million euro refurbishment of the Adare Manor hotel and golf resort, once the home to the Earls of Dunraven and now expected to reopen in September. I have come to this county and diocese with very few family connections with Limerick. I know of a few distant cousins on my mother’s side of the family, but I have been surprised to find many Comerford family connections with Limerick, some dating back to at least the 18th century. The Ennis Chronicle reported from Limerick on Monday 5 October 1795 on the marriage the previous Thursday at Silvermines, Co Tipperary, of William Ferguson, son of John Ferguson, of Limerick, and a Miss Comerford, daughter of Michael Comerford of Silvermines. The Ferguson family were woollen merchants and drapers in Limerick and also lived in Rathkeale, Co Limerick. The Limerick Chronicle reported on 18 December 1850 that Anne Comerford of Glentworth Street, Limerick had died at the ‘advanced age’ of 97. She was the widow of John Comerford of Killarney, Co Kerry. Half a century later, JJ Comerford of Kilkenny, who died on 29 March 1902, was a journalist and former Limerick correspondent of the Freeman’s Journal. On 4 January 1883, an inquest was held into the death of Mary Anne Comerford, an elderly woman, after an assault. She was 75 at the time. Delving further into Comerford links with Limerick, I have come across at least one Comerford from a family with roots in Co Carlow and Dublin, who was baptised in the second half of the 19th century in Castletown Church, near Pallaskenry, one of the four churches in my group of parishes; two Comerford nuns who lived about a century ago in a convent where one of the ‘residents’ in the attached ‘Magdalene Laundry’ was also a Comerford; a family of Comerford carpenters who lived in Limerick for at least four generations – some soldiers and RIC constables; and an interesting and unexpected connection between the Comerfords of Rathdrum, Co Wicklow, and Castleconnell, Co Limerick. In time, I hope to migrate the stories of some of these branches of the Comerford family in Limerick city and council to my site on Comerford family history. But I thought it was worth sharing these stories as I try to disentangle the roots and branches of these family trees. 1, Thomas Comerford, of whom next. 2, William Comerford, of whom after his brother Thomas. 3, Sarah Anne, was living in Dublin in 1849 when she was a witness at the wedding of her brother William Comerford. She was a dressmaker. On 29 July 1850, she married Timothy McMahon, tailor, of 128 Upper Dorset Street, Dublin, son of John McMahon, in Saint Mary’s Church (Church of Ireland), Dublin. 4, James Comerford (1830-), baptised Killeshin Church (Church of Ireland), Co Carlow, 21 March 1830. 5, William Comerford (1832-), baptised Killeshin Church, 13 May 1832. 6, Helen Mary (1834- ), baptised Killeshin Church, 19 October 1834. 7, Samuel Horatio Comerford (1842- ), born 13 December 1842, at 6 Bachelor’s Walk, Dublin. He was baptised in Saint Mary’s Church (Church of Ireland), Dublin, on 28 December 1842. 8, Mary Anne (1853- ), she was born on 23 September 1853 and was baptised on 28 October 1853 in Saint Peter’s Church (Church of Ireland), Dublin. 1, Samuel Henry Comerford, born 11 April 1867, baptised in Holy Trinity Church (Church of Ireland), Rathmines, by the Revd Loftus Shire. 1, Bridget, born 5 Granby Place, Dublin, 29 May 1850, baptised the same day in Saint Mary’s Church. 2, James Comerford (1851-post 1883), of Pallaskenry, Co Limerick, and Gardiner Street, Dublin, of whom next. JAMES COMERFORD (1851-post 1883), builder or butler, of Pallaskenry, Co Limerick, and Gardiner Street, Dublin. He was born at 133 Stephen’s Peer (?) on 20 August 1851, and was baptised on 29 August 1851 in Saint Peter’s Church (Church of Ireland), Dublin. He was living at 96 Lower Gardiner Street, Dublin, when he married in Saint Thomas’s Church (Church of Ireland), Dublin, on 17 May 1873 Elizabeth Lightly, daughter of Henry Lightly, hotel operator, of 96 Lower Gardiner Street. 1, William Henry Comerford, born 5 February 1875 in Pallaskenry, Co Limerick. James and Elizabeth Comerford returned to Dublin, and on 20 January 1883 when he was a witness at the marriage in Saint Thomas’s Church (Church of Ireland), Dublin, of Elizabeth’s sister, Maria Lightly, of 3 Upper Gloucester Street, and John Drew, house painter. Sister Mary Comerford and Sister Catherine (‘Kate’) Comerford, both born in Queen’s County (Co Laois) were nuns living in the Good Shepherd Convent, Clare Street, Limerick in 1901 and 1911. The Good Shepherd Convent became known as one of the ‘Mother and Baby’ homes or ‘Magdalene Laundries.’ Ironically, one of the women buried in the convent cemetery is Bridget Comerford who died there in 1958 at the age of 56. 1, Michael (‘Mick’) Comerford (ca 1850-post 1887), carpenter of The Island, Limerick, of whom next. 2, James Comerford (ca 1850-post 1901), carpenter, of King’s Island, Limerick, of whom after his brother. 1, Mary, born 21 February 1869. On 3 March 1895, she married in the Roman Catholic Cathedral in Limerick James Keane, labourer, son of John Keane, Palmerstown. 2, Margaret, born 31 July 1871. 3, Anne, born 8 October 1884. Hannah Comerford died in 1887, aged 30. Michael Comerford was a widower when he married on 23 April 1887 in Saint Michael’s Roman Catholic Church, Denmark Street, Limerick, the widowed Bridget McMahon, of Punche’s Row, Limerick, daughter of John O’Hara, farmer. They were living at Bridge Street, Limerick (1887), and he had died by 1895 when his daughter Mary married James Keane. 1, Mary (1869- ), born 25 May 1869, died in infancy. 2, Michael Comerford (1870-1907), born 17 December 1870, died 1907, of whom next. 3, Margaret (1871- ), born 31 July 1871. 4, Mary Anne (1872- ), born 10 July 1872. At the age of 19, she married on 16 January 1892, Thomas Joseph Jones (23), a soldier. 5, John Comerford (1876- ), born 7 July 1876. 6, Bridget, born ca 1877/1878, seamstress, aged 23 and living with her parents at the census in 1901. On 28 July 1901, in Saint Mary’s Roman Catholic Church, she married Michael Hourigan (23), sailor, of Shannon Street, Limerick. Their children included two sons and two daughters: Mary (born 18 March 1903, died in infancy); James Hourigan (born 18 March 1903); Mary (born 16 June 1910); and Michael Hourigan (born 25 February 1914). 7, James Comerford (1879-post 1901), born 15 May 1879, carpenter, aged 22 and living with his parents at the census in 1901. Mary Comerford died aged 52 on 9 October 1908. MICHAEL COMERFORD (1870-1907), carpenter, of Limerick. He was born 17 December 1870. He married in Saint Mary’s Roman Catholic Church, Limerick, on 2 March 1889, Mary Ann O’Dea, daughter of John O’Dea. Their addresses in Limerick included Mary Street (1892), King’s Island (1893-1895), Bank Place (1896), Saint Nicholas Street (1899), Castle Street (1900, 1901), Robert Street (1902), 18 Arthur’s Quay (1903-1904) and Edward Street (1905). 1, John (‘Jack’) Comerford (1889/1890-post 1915), general labour, of Limerick, of whom next. 2, Mary, aged 19 when she married in Saint Michael’s Church, Limerick, on 19 September 1890, Robert Murphy, aged 21, pork butcher, of Humphries Lane. Their children included three sons and a daughter: Michael Murphy (born 25 April 1910); Margaret (born 15 April 1911); John Murphy (born 15 October 1912); and Robert Murphy, born 6 March 1914. 3, Hannah (1892-1893), born 15 May 1892, died 3 November 1893. 4, …, an unnamed daughter, born 14 September 1893, who probably died at birth. 5, James Comerford (1895-1895), born 4 July 1895, died 9 July 1895. 6, James Comerford (1896-1901), born 13 July 1896 at the Lying-In Hospital, Bedford Row, Limerick; died 11 February 1901. 7, Michael Comerford (1898-post 1911), born 8 April 1898, aged 12 at the 1911 census. 8, Hannah, born 23 September 1900, died in infancy. 9, Bridget (1899-1958), born 10 August 1899, aged 11 in 1911, she was unmarried when she died on 22 July 1958, aged 59. 10, Norah, born ca 1901/1902, aged 9 in 1911. 11, Christopher Comerford (1902-1904), born 22 May 1902, died 18 March 1904. 12, Martin Comerford (1903-post 1911), born 9 November 1903, aged 7 in 1911. 13, Katie, born 30 December 1905, aged 5 in 1911. Mary Ann Comerford married her second husband, Michael Downey, clerk, of 9 Tailor Street, Limerick, son of John Downey, in Saint Joseph’s Church, Limerick, on 17 August 1915. JOHN (‘Jack’) COMERFORD (1889/1890-post 1915), general labourer, of Limerick. He was born ca 1889/1890, and living with his parents, aged 21 at the 1911 census. On 29 April 1911, he married in Limerick Roman Catholic Cathedral Mary Ellen Bennis. 1, Martin Comerford (1911- ), born 20 August 1911. 2, Maryanne, born 11 August 1911. 3, Mary Ellen, born 20 September 1913. She married in Limerick Roman Catholic Cathedral on 4 September 1938 Christopher Kennavane. 4, Josephine, born 11 March 1915. 5, Mary Bridget (1922-1923), born 1922, died 3 March 1923, aged 12 months. 1, Mary, born 10 March 1911. 2, Patrick Comerford, born 21 March 1912. 3, Richard Comerford, born 29 March 1914. 4, Margaret, born 12 August 1915. Two men named Daniel Comerford, one a police constable, and the other the father of a soldier, and a second policeman, Thomas Comerford, an RIC sergeant, are also found in Limerick in the late 19th century. JOHN ALPHONSUS COMERFORD, born 2 June 1899. JAMES COMERFORD (1875-1940), soldier, New Barracks, Limerick, aged 23, when he married on 20 April 1899 in Saint Michael’s Roman Catholic Church, Limerick, Nora Robinson, daughter of Joseph Robinson of Laurel Hill Avenue, Limerick. They later lived at 4 Saint Joseph’s Place Limerick. Nora died on 25 November 1936, aged 59; James was a British army pensioner and a widower, aged 65, when he died on 3 August 1940. 1, Josephine married Ivor Francis Widger, soldier, of New Barracks, Limerick, son of Frank Widger, on 1 September 1920, in Saint Joseph’s Church, Limerick. THOMAS COMERFORD, a sergeant in the Royal Irish Constabulary, and his wife, Mary Agnes (Little), were living in Ieverstown, Co Clare, when their daughter, Agnes Margaret Comerford, was born in Limerick on 24 November 1899. 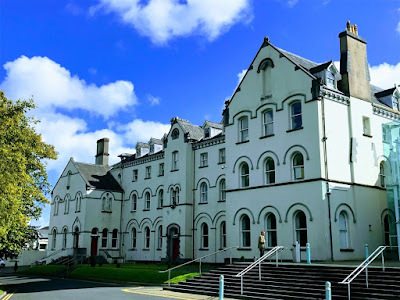 OWEN COMERFORD (1869-1945), who died at Gardenhill House in Castle Connell, Co Limerick, on 15 June 1945, was a member of the Rathdrum branch of the Comerford family from Co Wicklow who lived at Ardavon House, Rathdrum, Co Wicklow, and owned Rathdrum Mills. Owen Comerford was born on 11 December 1869. He was educated, with his brothers Edward Comerford (1864-1942) and James Comerford (1868-1924), at Oscott College, Birmingham (1880-1883). He was a shareholder in Rathdrum Mill. On 8 February 1898, in Saint Michael’s Church, Kingstown (now Dun Laoghaire), he married Kathleen Byrne, daughter of Laurence Byrne of Croney Byrne, Rathdrum. They later lived at ‘Coolas,’ Seafield Road, Clontarf, and he was still living there in 1940. Kathleen died on 17 October 1932. Owen later went to live with his daughter and son-in-law, at Gardenhill House, Castleconnel, Co Limerick. This house, built by the Blackhall family, is a substantial version of the characteristic three-bay two-storey house. Retaining much of its original form, the façade is enlivened by the timber sliding sash windows, limestone sills and slate roof. The ornate doorway adds artistic interest to the façade. The outbuildings add context to the composition and enhance the overall group setting. 1, Nora Kathleen (‘Norrie’). On 23 September 1940, she married James Henry Montgomery, civic guard, of Chapelizod Garda Barracks, Co Dublin. They later lived at Gardenhill House, Castle Connell, Co Limerick (1945). They had no children. Norrie Montgomery died in 1972. Last updated with additional photographs: 5 November 2017; 6 November 2017.